The Original Cuffy’s location, the whole family can enjoy our yard games, arts and crafts, face painting, and many more activities to help make your family vacation a memorable one. Plus an authentic old-fashioned General Store located right next door. Conveniently Located right next store to our flagship West Dennis location, this store gives you a authentic view of life at the turn of the century. With our antique displays and nostalgic wares you’ll be able to take home souvenirs that your entire family can enjoy for years to come. This location features a beautiful sand sculpture on each floor, giving you a visual history of Chatham while you shop. The arts and crafts station on the first floor will give your children a memory to take home that will last. Originally a house built in the 1800’s this location maintains the authenticity of the era. 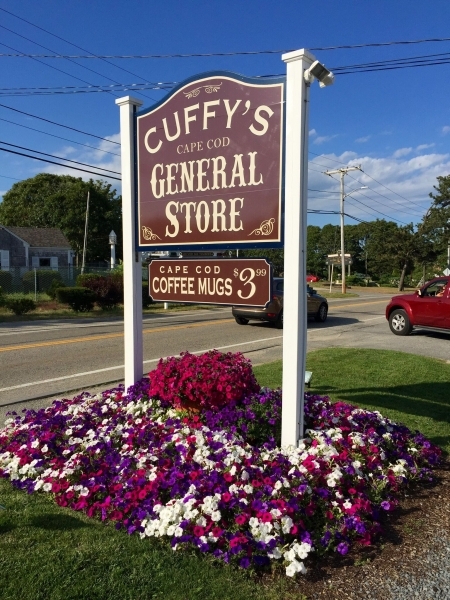 Little has been changed to the architecture, and all your favorite Cuffy’s clothing items is displayed on antiques of the time. Located right next to the pier on commercial street, this location gives you and your family a beautiful view perfect for a family photo in your new Cuffy’s clothes. The sand sculptures in our windows show a historical representation of the original town settlers, and our model T car will give you a fun and unique way to browse our latest items.